Along with the fact that my friend tended to favor experimental stuffs à la the White Album rather than its straight-up ballads, the simplicity of his remark struck at the irresistibly simple draw of this Lennon-McCartney love song. There is an effortless simplicity about the song, with a most familiar balladic vocabulary running along a most smooth-sailing melody. 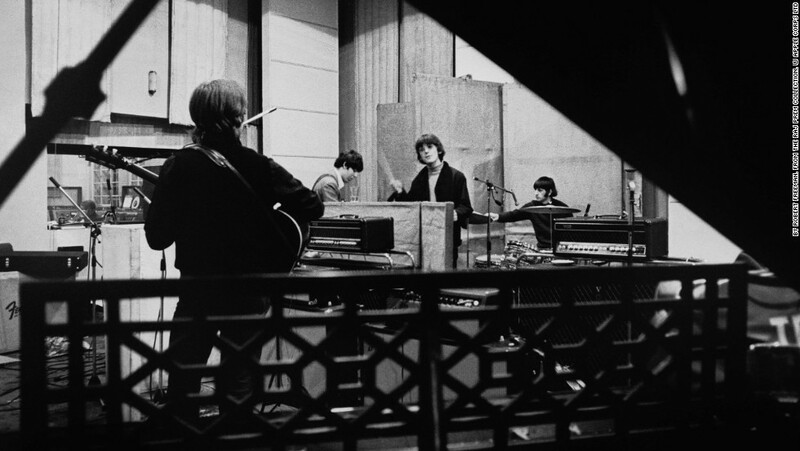 Then there is the equally effortless rendition by the Fab Four, who improved it to the point of, well, perfection. From the opening bars – the electric guitar chords around G-major, the gliding supporting vocals, and the introductory sentence – it ushers in instant freshness and promptly shifts our state of mind from blues to light, from weightiness to loftiness. The opening of the first verse – Here, making each day of the year… – casts a near-perfect illusion of romantic perfection over us. By the end of the same verse – nobody can deny that there’s something there – it has thoroughly wrapped us in its wings and carried us up and out into the clouds. For the next two minutes, we peacefully allow it sweep away our minds and hearts completely into the aforementioned illusion. The delightful illusion continues in the next number, the classic “Yellow Submarine,” albeit under than above water, before returning to the heavy mode in “She Said, She Said”. Location in the album aside, the utter loveliness of the original recording lies in the simplicity of instrumentation. The pace of the song is on the faster end for a ballad, and from start to end, Ringo’s drums and John’s guitar keep it go steady without a hint of hurrying anywhere. Mostly it is the snare drum and rhythm guitar hitting the same beat, and only a few times does Ringo hit the tom-toms – and only once the single cymbal and never its double counterparts. Kept to the minimum is Paul’s bass, and only one small and two tiny ornaments are added: a soft guitar counter-melody running along the second half of the refrain, very light finger-snapping during a couple of bars near the end of the song, and a horn blowing equally soft support to the last three or four notes. 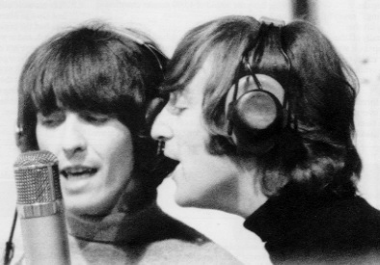 Nothing even remotely fancy is allowed to overshadow the gorgeous backing vocals of John and George that carry Paul’s double-tracked voice, which is lyrical but also cool and non-modulated throughout the entire rendition. Perhaps only “And I Love Her” could rival this relative lack of analysis, for both songs are charmingly simple in both lyrics and chord progression. In the case of “Here, There and Everywhere,” the chord changes at every bar, and shifts from major in the verse to minor in the refrain then back to major again. As for lyrics, they build themselves into blocks around the words in the title – “here” for the first verse, “there” for the second, “everywhere” connecting the refrain to the third, and all three are affirmed together at the very end. Besides this trio of central adverbs, the lyrics contain largely of one-syllable words commonly found in a love song: nouns having to do with either time (life and day and year) or body parts normally associated with romance (hand and hair and eyes), and verbs expressing the broadest sentiments (live, die, want, need, share and, of course, love). To enhance the ethereal feeling, the entire song is in the present tense, supported by a lot of -ing-ending verbs – both of us thinking how good it can be, knowing that love is to share, watching her eyes and hoping I am always there. Along with the charming melody, the very familiar vocabulary helps the song cast its fast spell on its listeners and draw out their loftiest romantic vision in a matter of seconds. About its status as a recorded standard, it doesn’t belong to the same league as “Yesterday” and “Something”. But there are many versions out there – the prettiest I have heard is from Emmylou Harris, in an album of hers from the mid-Seventies. But like so many covers of Beatles recordings, none of these versions comes close to the breathtaking beauty of the original recording. It isn’t the Beatles best song ever, as alleged by my friend. Or even Paul’s most complete one – I agree with Mark Hertsgaard, author of A Day in the Life, that “Penny Lane” holds that honor for gorgeous melody and, unusual for Paul, lyrics full of lovingly detailed snapshots. But it is Paul’s best love song – and the Beatles’ most perfectly recorded one. Best and perfect, because it possesses a beauty that wastes no time in sweeping us off the ground from the opening moment and plays straight into our youthful longing of romantic perfection, a longing so often illusory and yet so necessary in the psychical lives of many of us. A newer favorite cover comes from these two members of the French band Nine&Uzzo. Most YouTube music videos could be heard without looking at the screen. But this video should be watched for the lovely interaction between singer and instrumentalist.